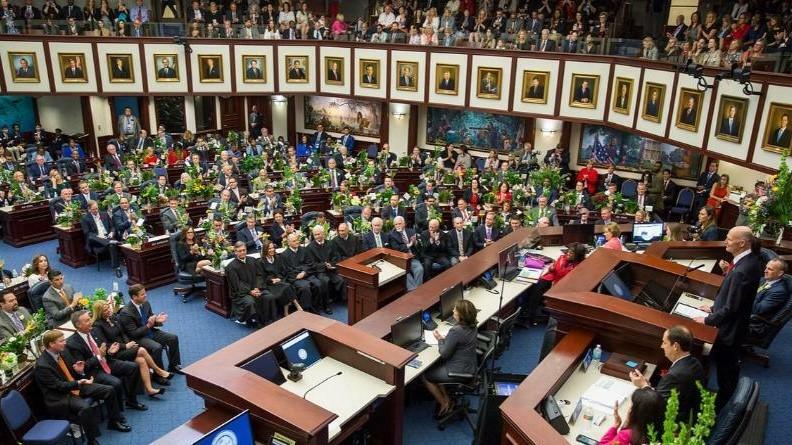 DeSantis will give his first State of the State address Tuesday morning during a joint session of the House and Senate. Lawmakers then will spend 60 days passing bills, negotiating a budget and considering DeSantis’ priorities, which include boosting environmental spending, giving teachers bonuses, lifting a smoking ban on medical marijuana and expanding school choice. Lawmakers will also dig into the governor’s $91.3 billion budget proposal --- the largest in state history. Republican leaders, however, say the final version of the spending plan will likely look much smaller by the time it hits DeSantis’ desk in May. “His budget, I remind people, is simply a recommendation. It is nothing more than that,” Senate President Bill Galvano, R-Bradenton, told The News Service of Florida. That means a top priority of DeSantis, a proposed $625 million package for water resource projects, will likely be slashed to meet other financial needs in the state, like recovery costs from Hurricane Michael, Galvano said. The governor’s priorities will be dissected during the legislative process, and they will be impacted by the power dynamic that plays out between the executive and legislative branches and between the House and Senate --- often seen as turf wars. DeSantis, however, has assembled an administration with former powerful lawmakers in key posts that could help some of his policy priorities. Former House Speaker Richard Corcoran, who now serves as education commissioner, will advocate for the governor’s education agenda, which includes a $422 million teacher-bonus package, changes to a state scholarship program for bullied students and creating a new voucher program that would allow low-income students to use taxpayer-funded scholarships to go to private schools. Lt. Gov. Jeanette Nunez, a former high-ranking lawmaker, also will be a powerful voice in the administration, and DeSantis has appointed former Rep. Halsey Beshears to run the Department of Business and Professional Regulation and former Rep. Jared Moskowitz to head the Division of Emergency Management. It is also important to note that state lawmakers are enthused to see DeSantis have a good rapport with them, something that some say was not the case with his Republican predecessor, Rick Scott. “DeSantis seems to value legislators and our input more than his predecessor. ... There’s just a general good faith and good will,” Galvano said. Galvano, however, said the Legislature will not simply partner with DeSantis. So far, DeSantis has been able to make unilateral decisions and has encountered few hurdles in getting things done, Stipanovich said. “He has yet to face a situation where he needs the cooperation of those he does not control,” Stipanovich told the News Service. Democratic lawmakers, who have long struggled to get things done in the Republican-controlled Legislature, see promise in some of the governor’s proposals. “Seeing Gov. DeSantis set the standard that we are going to stop sweeping trust funds is really promising,” state Rep. Carlos Guillermo Smith, D-Orlando, told the News Service, referring to a longstanding practice of lawmakers taking money out of dedicated trust funds to pay for other budget priorities. “It’s not that hard to raise the bar when your predecessor left it on the ground,” Jenne told the News Service. Democrats have criticized DeSantis’ proposals to expand school vouchers. Also, Jenne said he is concerned about two measures DeSantis has backed: a ban on so-called sanctuary cities and a ban on the oil- and gas-drilling process known as fracking. “I fully expect Gov. DeSantis to pursue xenophobic legislation regarding immigration and push for the fake fracking ban that will actually allow it to occur. Those two issues are the tip of the iceberg,” Jenne said. DeSantis has also vowed to sign into law issues such as abortion restrictions and a statewide mandate to use E-Verify, a system for employers to verify whether people are eligible to work in the U.S.
Those issues have been filed for consideration this session, and a “sanctuary cities” ban, sponsored by Sen. Joe Gruters, the chairman of the Republican Party of Florida, has started moving forward.